I have always been interested in history although to be honest I thought of history as been pertaining to others. Since the death of both my parents, I have become aware of the part we all play in the making of our society. I have become involved in tracing my family’s history and Penn village plays it’s part in that story. Following a chance meeting with Bev Parker at a Penn history exhibition, he convinced me to write down some of my earliest recollections. This is my memory of those times in the early 1950’s through to the 1970’s. Should any reader be able to add anything to my recollections I would love to hear from them. Following my birth in 1948, my parents needed somewhere a little more spacious than a bed-sit in Newhampton road in which to swing the proverbial cat. They were on the council waiting list and as such, had to wait till a council house became available. A new estate was been built in Castlecroft but it would be a few years before the first residents would be moving in. Home became a flat over a butchers shop on the Penn road; this was located just past the junction with Manor road. The last building in the block, number 309, was a barber’s shop which dad took over. Penn at the start of the 1950’s was in many ways a very different place to Penn today. The section of dual carriageway that runs from Lloyd hill to Manor road had not been built yet and Penn still had a remote village feel about it. Behind the block of shops was a blacksmith’s forge, which I believe was run by the Roden family at one time; in those days every village, had one smithy or more. I am not sure but I believe the landlord was a “Miss Hill”. Across the road between the Roebuck and the shops lay the path through the woods that lie behind the Roebuck public house where dad took me to kick a football about. This lane also provided a quick route to the Penn cinema in Warstones road. I can just remember the milkman with his horse and cart and the whispering giants known as the trolley busses making their way to Penn terminus where they completed a loop enabling their return to Wolverhampton. 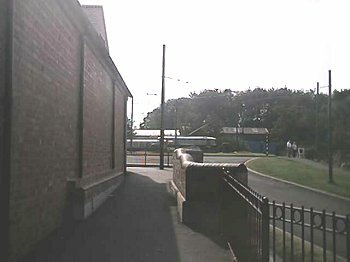 This picture taken at the Black Country Museum shows the trolley bus wires and poles as they would have been through Penn. The route number was 11 and the town stop was in Queen Square and Victoria Square where the clippie would jump down, retrieve a pole from under the bus and swap the collector arm onto the Penn bound overhead lines. The trolley bus ran down Lichfield Street, through Queen Square into Victoria Street, Worcester Street and onto the Penn road. As it passed the dairy at the junction of Lea Road, you could see the bottles on a conveyor belt as they rattled through the bottling plant. 1 Penn circa 1970 and the Y.W.C.A.